For years, economists, including no less than former Fed chair Janet Yellen, talked about the concept of “asymmetric risk,” or AR. In this earlier context, which related to monetary policy, AR maintained that the risk of weak demand was greater than that of faster inflation. Therefore, the full-employment side of the Fed’s mandate should get more weight in interest rate decisions than the stable-prices part. With some important caveats I’ll get to below, there’s a new AR in town, this time as regards fiscal policy. As I’ve written in many places, thanks to the deficit-financed tax cuts and new spending bill, the deficit as a share of GDP is going to be unusually large, given that we’re likely closing in on full employment. As John Cassidy points out, some analysts, quite reasonably, worry that stimulating an economy so close to full employment is a basic economic mistake. It’s being more Keynesian than Keynes. Such stimulus won’t deliver more real economic activity, like jobs or real wage growth. It will just deliver more inflation and higher interest rates, which we slow growth. Added fiscal impulse at this point, they fear, will add more heat than light. I share their concerns, but I think AR is in play, which points towards supporting this fiscal experiment. Once again, the risk of insufficient aggregate demand is greater than that of overheating. Let me explain. Here’s the thing about that: neither you nor I know that to be the case. 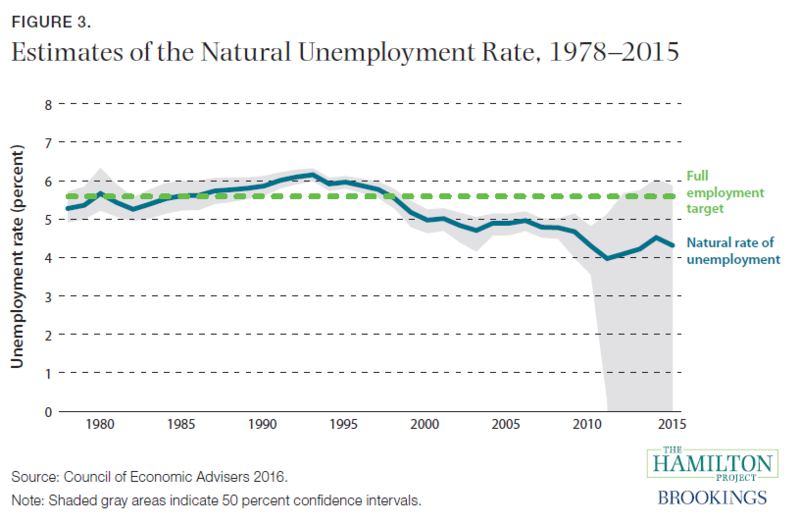 The first figure below shows that it is beyond our ability to identify the lowest unemployment rate commensurate with stable inflation. 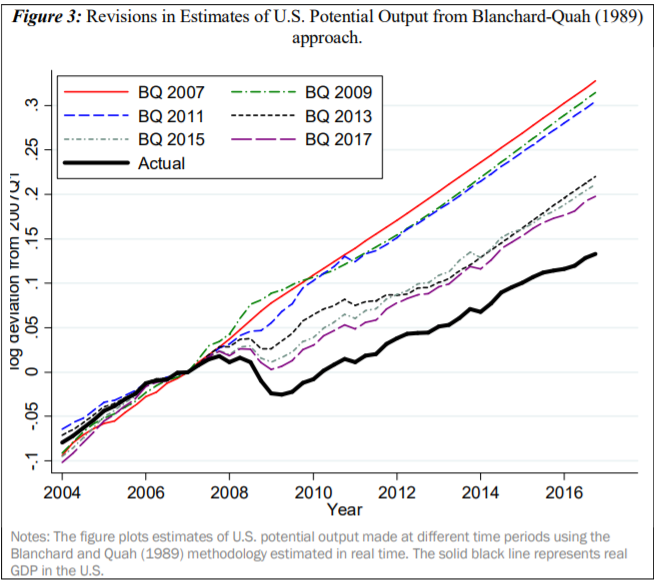 The next figure is trickier but it’s explained in this important new paper from our Full Employment Project that recalculates potential GDP, or GDP at full utilization. The thick, bottom line is actual GDP relative to its 2007 level and the middle clump of lines are the relevant re-estimates, using an arguably better technique. They show that there’s maybe 5 percent of GDP more untapped capacity than the conventional wisdom suggests. Meanwhile, inflation, which is the main risk of overheating, has been too low for too long. The Fed has missed its 2 percent inflation target to the downside for years running. Ergo, given that we cannot confidently assert that we are at full employment or full capacity, that there are still people left behind, that wage trends and employment rates for some groups of workers are still on the mend, that inflation remains low and below target, and that if it did speed up, the Fed has ample room to hit the brakes, this hyper-Keynesian experiment is worth undertaking. OK, caveat time, and there are good ones which I take seriously. –It’s not just faster inflation we should worry about. It’s also higher interest rates, which could slow down growth and hurt the real variables we care about. As debt investors sniff wage and price pressures, they’ve insisted on higher inflation premiums. As I write, the yield on the 10-year Treasury is up about 40 basis points this year, at about a 4-year high. For years, the evidence for bigger deficits nudging up interest rates was nowhere to be seen. But that could be changing, and if so, the AR becomes less A and more balanced. –This particular fiscal stimulus has lousy multipliers. Some of the spending in the budget deal may end up supporting useful infrastructure projects and providing much needed disaster relief—worthy expenditures that could help tighten the job market in places where it’s still slack. But the regressive tax cut is terribly targeted, and any fiscal stimulus is less potent when the Fed is pushing in the other direction, albeit slowly. So even if the AR scenario is correct, the bang-for-the-buck here is sure to be weak. –Even if this AR scenario is in play this year, it may not be next year. The fiscal impulse from all this spending is, by some estimates, about the same both this year and next (Alec Phillips at Goldman Sachs finds that the growth impact should be about an extra 0.7 percentage points in 2018 and 0.6 points in 2019; no link). So, if added fiscal impulse doesn’t trigger overheating in 2018, it could do so in 2019. In sum, asymmetric risk doesn’t mean no risk. And given the unusual, pro-cyclical timing of all this spending and tax cuts, the risks engendered by these fiscal dynamics are unquestionably worth watching out for. But if this extra spending can knock the unemployment rate down to the mid-3’s by the end of this year without triggering more than the expected and manageable amount of price and rate pressures, then, from the perspective of those who’ve yet to benefit from full employment, it will be worth it. Share the post "The new asymmetric risk"
5 comments in reply to "The new asymmetric risk"
My intuition says that towers above everything else. I don’t believe for one minute that stealing poor people’s healthcare and giving the money to the already-rich is going to stimulate anything other than Republican greed. With the rich burying the cash in higher yield tax free T-Bills and stock buybacks won’t stimulate anything of consequence. Prime age workforce participation is at 81.8. For all of the 2000s, it never dips below 82.6 until Sep 2009. How many times was it even 81.6 in the 116 months up to that point? 81.7? 10. So 15 times out of 116, it was a little less than a full percent greater. 86 percent of the time, 1 million more people 25 – 54 are working. And the 2000s was awful in terms of job creation and wages even before the Great Recession. How many times does one have to remark on this? While it’s not certain participation will return to normal, it shouldn’t be a surprise or unexpected either. More people working creates it’s own multiplier effect. What should concern people in times of growth should be inequality. It should be wage distribution. Greater inequality was a feature of the Clinton late 90s boom. This blog likes to point to it as some golden time when it obviously wasn’t. Aside from lowering the capital gains tax, refusing to regulate derivatives, repealing Glass Steagall, passing NAFTA, creating new FLSA exemptions, encouraging tuition hikes by all colleges by protecting banks instead of cutting down on abuse by for-profit institutions, inequality was rising on a scale of the Reagan years. Jared Bernstein is fundamentally wrong about this in relying on faster growth to pick up workers wages at all levels. Yes, lower incomes will prosper more during good times. But income distribution actually gets worse. There is nothing in Bernstein’s Full Employment agenda that would change current income distribution. The central argument of liberal economists is that potential GDP is greater than estimates, so the economy can expand without causing rising wages and inflation. One fails to see how the continued obsession with wages as a cause for inflation can lead to anything but failure to address the needs of workers to change income distribution. America is so rich, and the safety net, inadequate but measurably significant, that distribution need never change for the economy to grow, and everyone to gain, if only by tiny margins for the lower 80 percent. I sure hope Bernstein is right. The February 2 report of a 2.9% increase in wages sure freaked the big players out. Bonds crashed as yields shot up, equities markets got the vapors. The problem is, wage earners got into to the party. But, with about a 70% share of the economy now consumer related, it’s hard to see how the economy can continue to expand while leaving consumers behind. As most consumers are wage earners, the 2.9% should have been good news. It sure wasn’t. Completely true that nobody knows for sure when full employment is reached or even what full employment really means. It could mean only full employment of all those who want a job but it could also mean full employment of all productive capacity, including workers, but also of the existing capital stock and even new capital that’s not yet come into existence for a lack of sufficient consumer demand. In other words, when workers are fully employed there’s still room for increased capital investment raising productivity which in turn would boost potential GDP and not result in increased inflationary pressures. The Phillips curve model doesn’t account for the last possibility which is one reason it has no predictive value on inflation. The chart below shows the unemployment rate and core CPI inflation since the financial crisis. Inflation is still well below the peaks reached in 2012 and then again in 2016 despite the large decline in the unemployment rate. Note this data includes the latest CPI report for January. People who thought inflation could not decline in 2016 were proved wrong when it did decline in 2017. And today it’s still well below target.